Japan is an earthquake-prone country. Including the Great East Japan Earthquake that occurred on March 11, 2011, the country had more than thirty earthquakes in the past ten years that caused damage to buildings and human life. 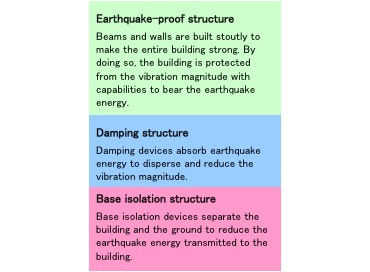 Haseko, in the belief that it is the mission to supply condominiums that protect the life and fortunes of customers and minimize damages from earthquakes, has conducted research on earthquake proofing, damping and base isolation structures at the Technical Research Institute over the many years. In particular, its base isolation structures boast characteristics that can alleviate not only damage to buildings themselves but also within housing units. Haseko proactively works to apply these structures if, after conducting ground investigations at sites planned for construction, they are chosen as the most appropriate construction method in consideration of the special features of the land. 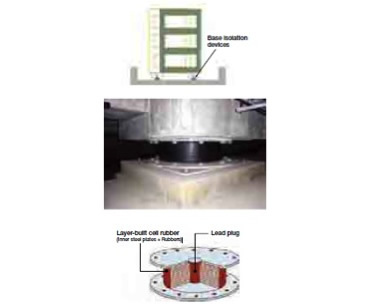 Condominiums with base isolation structures have the advantage that users can use and cherish them over a long period of time, as they do not allow the building to tremble and thus prevent cracks from occurring, on top of securing safety. In the coming “stock” society where an increasing number of buildings are used over a longer term, it is important to activate transactions and establish the market of existing condominiums. In such a market, risk of damage from earthquakes and the possibility of inexpensive repairs in the case of damage may be reflected in the asset values, and seismic isolated condominiums may be evaluated and priced more highly than current levels.